Visual Arts A Designed Life: Contemporary American Textile, Wallpapers, and Containers & Packaging, 1951 – 1954 September 13 – December 8 Opening Reception: Thursday, September 13, 5 – 7 p.m. Center for Art, Design and Visual Culture The Center for Art, Design and Visual Culture presents A Designed Life: Contemporary American Textile, Wallpapers, and Containers & Packaging, 1951 – 1954, an exhibition based on three historically significant traveling exhibitions of contemporary mass-produced, American-designed consumer goods that were commissioned by the U.S. Department of State in the early 1950s. It recreates and interprets those early Cold War exhibitions — including American textiles, wallpapers, containers, and packaging — restating and interpreting part of each display as it might have appeared in the early 1950s. The three historical exhibitions — Contemporary American Textiles designed by Florence Knoll; Contemporary American Wallpapers designed by Tom Lee, and Containers and Packaging designed by Will Burtin — were each developed as collections of industry-specific consumer goods, designed and manufactured in the spirit of American modernism. The Traveling Exhibition Service (TES), an organization later known as the Smithsonian Institution Traveling Exhibition Service, organized these exhibitions for display in post-WWII Germany on behalf of the U.S. Department of State in order to help promote the grown of democratic governments within postwar Europe. 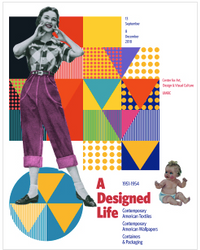 Margaret Re, an associate professor of visual arts who teaches design, is both the exhibition curator and principal investigator of A Designed Life. Re is excited for the potential of the exhibit to help audiences explore the U.S. Department of State’s decision in the early 1950s “to connect consumer choice with political choice as well as the reception of European audiences to such cultural diplomacy in the post WWII years.” Forthcoming is a scholarly catalog that documents and preserves the exhibition A Designed Life, published by the CADVC and distributed internationally through Distributed Art Publications. This publication will bring to light detailed and previously undocumented information about the collective thinking and efforts of government officials and agencies, design professionals, manufacturers, and museums who contributed to the making and distribution of Knoll, Lee and Burtin’s exhibits. Contributing essayists include Greg Castillo, Stuart W. Leslie, Jan Logemann, Margaret Re, and Virginia Gardner Troy. The Opening Reception (free and open to the public) will be held on Thursday, September 13, from 5 to 7 p.m., and the exhibition will open for regular viewing hours on Friday, September 14.